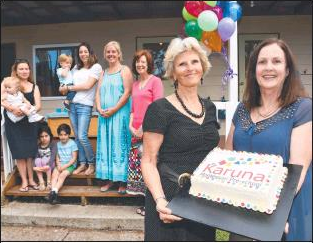 Karuna Montessori Pre-school at Narraweena has unveiled a new look for its 30th Anniversary. Preschool Vice President Michelle Hofmann said they had spent the past nine months redesigning their “look and logo”. The new sign was unveiled to parents during a birthday party on Thursday to celebrate with staff and current families. There was also face painting for the kids, and everyone kicked up their heels to celebrate the preschool turning 30. “We wanted to celebrate 30 years with a refreshed look because we are all pretty excited (about reaching this milestone) and it’s a great birthday present for the school,” Ms Hofmann said. A special moment was celebrating the people who had attended the centre themselves who have children as current students. Manly Daily, Saturday, 11 October 2014.